Animated: No; Low-poly: Yes; Materials: Yes; Rigged: No; Textured: Yes; UV Layout: Yes; 3D File Formats Included: .3ds (multi format), .c4d (cinema 4d), .fbx (multi format), .max (3ds Max), .mb (maya), .obj (multi format); Created In: maya 2014; Geometry: Polygons; Poly Count: 3200. 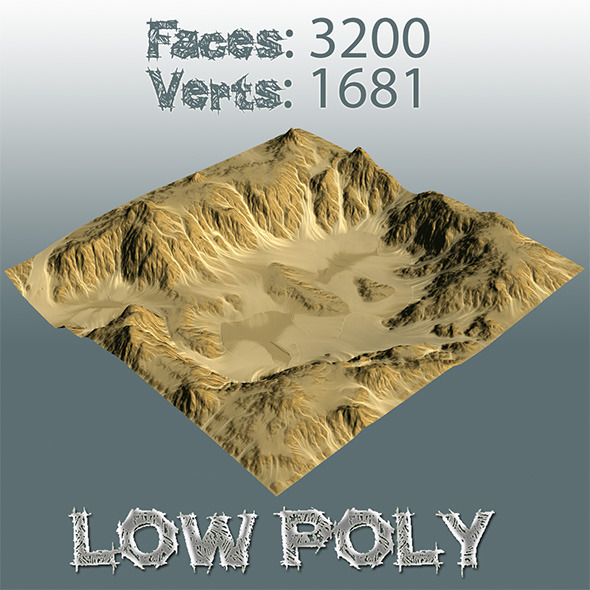 -Displacement map included so you can create fast terrain in your favorite 3D engine and apply these maps. Snow_M_B_200515; Brown_C_29042015; Brown_B_29042015; Desert_Rock_Circ_B_300315; Snow_M_A_020515. Keywords: background, canyon, desert, earth, environment, game, hill, land, landscape, level, lowpoly, map, mountain, planet, terrain, valley. Best stock graphics, design templates, vectors, PhotoShop templates, textures & 3D models from creative professional designers. Create 3DOcean Brown A 24032015 11408677 style with PhotoShop, Illustrator, InDesign, 3DS Max, Maya or Cinema 4D. Full details of 3DOcean Brown A 24032015 11408677 for digital design and education. 3DOcean Brown A 24032015 11408677 desigen style information or anything related.